This solution below shows the Lenovo A6000 LCD display backlight components that holds and control for the LCD screen display backlight to glow. If one of these components may become faulty due to wet or water damaged it will result to LCD’s backlight failure. You may need to trace the connection line tracks, supply voltages and check some of the backlight LED driver components shown on the solution above. You may start to check the highlighted components for it is more prone to be easily damaged when a short circuit occurred. Check and replace if already found damaged. 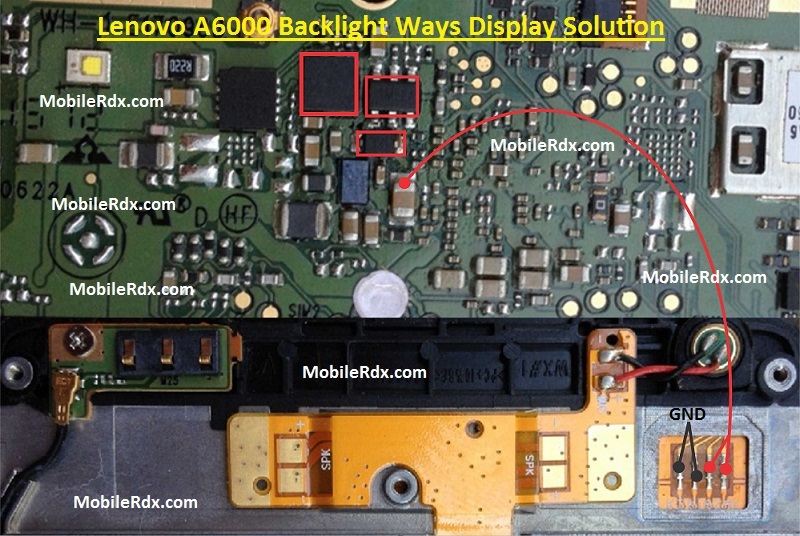 Here’s some hints on how to troubleshoot the “Lenovo A6000 LCD display backlight not working problem”. Check the display filter resistors including the LCD supply voltage and trace the connection tracks to the LCD pin connector. Replace the damaged resistor or mind to reconnect if there is an open line paths.